It's easy to take the performance of your dishwasher for granted when it reliably cleans your dishes year-after-year. The contribution of this important kitchen appliance is often appreciated only when it is on its last leg. The average lifespan of a modern dishwasher is approximately 6-10 years.1 Over time, major components like the motor or pump may wear out, and out-of-warranty repairs can easily run $400-$600 or more once parts, labor and trip costs are calculated. In recent years, repair costs have increased while the cost of new dishwashers has decreased.1 This means it could be better to replace a dishwasher that is failing than to fix it. If you attempt to run your dishwasher and all you hear is a humming sound, it is possible that the motor is failing. Your repairman may turn off power to the dishwasher at the circuit breaker before checking to see if the fan blades move easily. If they do not, it is possible that the motor is the problem. Compare the cost of purchasing a new machine versus replacing the motor. If your dishwasher does not properly circulate water during the wash cycle or the water fails to drain at the end of the cycle, you may have pump problems. The water circulation pump has bearings that may wear out over time. When this occurs, you may hear a low-level drone when the pump is operating. A failing drain pump will also get noisy as it wears out. If your pump fails, you’ll need to decide if you want to replacement of the pump or the entire dishwasher. The heating element serves two purposes. It keeps water hot during the wash cycle, and it helps with the dry cycle as well. When a heating element fails, dishes will not come out as clean or dry as they once did.3 Although the part is not that expensive, labor and trip costs sometimes are. When major components break or wear out, dishwasher repair costs can easily escalate. It is also possible that an aging unit may require more repairs in the future. When a dishwasher is on its last leg, it might make good economic sense to reward yourself with a new, energy-efficient model. 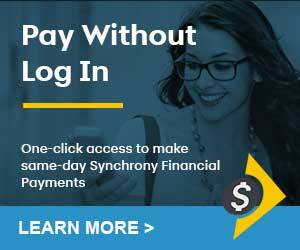 Synchrony Financial financing is available through our many partners who sell appliances. Find one in your area now.